Among various applications of statistics, let us confine our discussions in the following fields. Now, let us discuss the application of statistics in the above fields in detail. Modern developments in Economics have the roots in statistics. In fact, Economics and Statistics are closely associated. Time Series Analysis , Index Numbers, Demand Analysis etc. are some overlapping areas of Economics and statistics. In this connection, we may also mention Econometrics – a branch of Economics that interact with statistics in a very positive way. Conducting socio-economic surveys and analysing the data derived from it are made with the help of different statistical methods. statistics, plays a key role in Economics for making future projection of demand of goods, sales, prices, quantities etc. 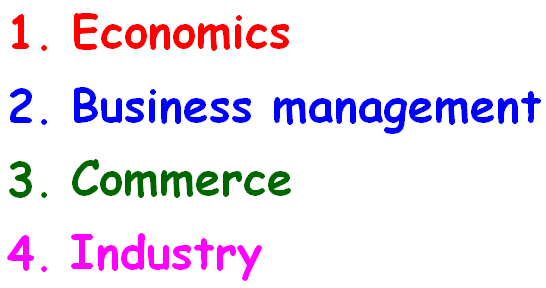 which are all ingredients of Economic planning. Gone are the days when the managers used to make decisions on the basis of hunches, intuition or trials and errors. Now a days, because of the never-ending complexity in the business and industry environment, most of the decision making processes rely upon different quantitative techniques which could be described as a combination of statistical methods and operations research techniques. So far as statistics is concerned, inferences about the universe from the knowledge of a part of it, known as sample, plays an important role in the development of certain criteria. Statistical decision theory is another component of statistics that focuses on the analysis of complicated business strategies with a list of alternatives – their merits as well as demerits. In this age of cut-throat competition, like the modern managers, the industrialists and the businessmen are expanding their horizons of industries and businesses with the help of statistical procedures. Data on previous sales, raw materials, wages and salaries, products of identical nature of other factories etc are collected, analysed and experts are consulted in order to maximise profits. Measures of central tendency and dispersion, correlation and regression analysis, time series analysis, index numbers, sampling, statistical quality control are some of the statistical methods employed in commerce and industry. Even though we have various applications of statistics, there are some limitations too. Now, let us look at the limitations of statistics. 1. Statistics deals with the aggregates. An individual, to a statistician has no significance except the fact that it is a part of the aggregate. 2. Statistics is concerned with quantitative data. However, qualitative data also can be converted to quantitative data by providing a numerical description to the corresponding qualitative data. 3. Future projections of sales, production, price and quantity etc. are possible under a specific set of conditions. If any of these conditions is violated, projections are likely to be inaccurate. 4. The theory of statistical inferences is built upon random sampling. If the rules for random sampling are not strictly adhered to, the conclusion drawn on the basis of these unrepresentative samples would be erroneous. In other words, the experts should be consulted before deciding the sampling scheme. After having gone through the stuff given above, we hope that the students would have understood "Application of statistics".